People buy automobiles after doing research for a considerable amount of time. Time being at a premium these days, they often use the net on their mobile phones to search for information. Advertising by auto companies must factor this trend in their media planning to reach their potential customers who are likely to be most receptive to their message. 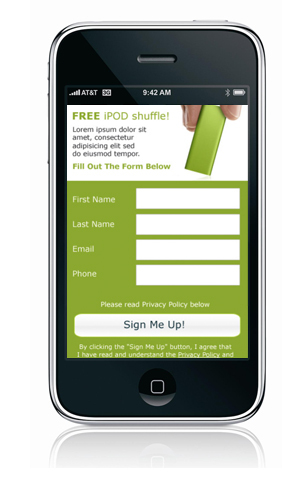 Nielsen data from October 2010 reveals that the US mobile web audience has increased to over 88 million from 67 million in December 2009. Smartphone users have been especially active in accessing the net from their phones. 13 of the top 20 mobile phones in November 2010 were Smartphones, according to Millennial Media’s Mobile Mix report for November 2010. The rise of Smartphones is due in part to the advertisers’ ability to develop targeted and specific rich media for these handsets. A doubling of the proportion of Expanded Rich Media in the Campaign Destination Mix from 3% to 6% shows that auto advertisers, like entertainment brands, are not tweaking Internet creatives for the mobile. They are designing customized rich media elements for their campaigns for the mobile (Millennial Media’s S.M.A.R.T Report, June 2010). Millennial Media’s S.M.A.R.T. report for October 2010 reveals that auto in-market intenders access mobile content between one to three times each month as they research new car purchases. This led to auto apps entering the top ten mobile application categories for the first time in October. Advertisers in the auto vertical leveraged the Store Locator/View Map in possible post-click campaign actions to increase footfall in their brick-and-mortar outlets, according to Millennial Media’s S.M.A.R.T Report for July 2010. Lenco Mobile is a mobile solutions and technology group with an international presence. It can help auto manufacturers develop customized campaigns for mobiles. Besides using MMS and SMS to communicate targeted messages, Lenco Mobile’s specific tactics for lead generation using mobi sites and apps can increase auto sales or assist auto manufacturers in research, pricing, customer service, and retention. Apple redefined the tablet world in 2010 achieving 95 percent market share with iPad, an impressive statistic according to a report released by Strategy Analytics. Release in April 2010, within 80 days, 3 million units were sold. 2011 has been dubbed by technologists “The Year of the Tablet” so let’s take a look at some of the hottest ones that could give Apple a run for its money. Watch for Apple’s second version to hit a grand slam as well however with the feature rich offerings below, holding that 95% market share will be a challenge. One of the reasons Apple has cultivated such a lead is the way their philosophy translates to brand with the software and hardware being seamlessly engineered. The Motorola Mobility Xoom which will be available on Verizon Wireless received a great deal of face time and fanfare at CES as it was running Android 3.0 (Honeycomb), the hottest new tablet operating system from Google. It may be the tablet with the fullest feature set. Check it out: It’s got a lightning fast 1 GHz dual-core processor, front and rear facing cameras, Flash support, 720p video recording and 1080p playback, a crystal clear 10.1-inch screen and what’s most impressive and exciting is the ability to upgrade it to LTE/4G down the road by simply switching out a card! This is the first tablet in the space to offer this. Bottom line is this puppy screams and is gorgeous to look at, set to enter the stage in Q1 and predicted to be a major competitor to iPad especially with Verizon’s loyal and tech-insatiable consumer base. The BlackBerry PlayBook created buzz when a viral video on YouTube Research In Motion posted showed how much faster and more robust sites like the one for the FIFA World Cup loaded in speed tests. What’s exciting is the device will be supported on Verizon which is a user base of BlackBerry enthusiasts who will love the ability to sync up with a tablet on the go. It’s a dual core with a smaller 7” screen, still crisp and handles multi-tasking so well that two HD videos can stream simultaneously. It features double HD cameras, fast wifi ready insides and brings that classic polish that the brand has always levered to cater to business types. The Vizio Tablet gets its namesake from the California based company that grew to massive popularity making affordable meets quality HD flat screen TVs. The goal here is to fit in with the VIA Plus Ecosystem where the tablet can seamlessly interface with the TVs through its own operating system, a nod to how Apple’s devices talk to each other and share content. It’s an 8-inch tablet with a 1 GHz processor. The new Vizio Internet Apps Plus is the operating system that runs on the big screens and tabs. This will probably be a top seller for its unlimited plug and play status and attractive price point. The Samsung Galaxy Tab LTE has already been selling very well in 2010; 600,000 units sold in the first 7 days, it hit the one million sold mark in December of 2010, two months after it launched. Verizon and Samsung generated some major buzz at the Consumer Electronics Show in Vegas this year when they announced the device would be available on its new 4G LTE Broadband Network. The 5 megapixel rear-facing camera will also be an option. 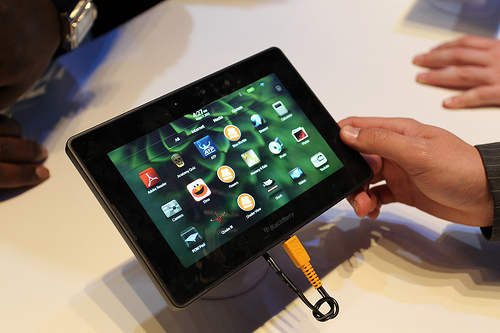 The tablet has a 7” LCD touch screen running Android 2.2, features a 1 GHz “Hummingbird” processor and supports phone functionality as a speaker phone. Overall, the experience is elegant, fun and portable. Visit Lenco Mobile, a leading mobile solutions group, to find out more about tablets. *By analyzing the margin for error in the Nielson analysis, ReadWriteWeb points out that Apple and Blackberry are tied for the top spot or tied at the third spot Android holds. How does this compare with your selection of a mobile phone on your carrier? Do you prefer BlackBerry or iPhone? There are exponentially more app choices progressing from Blackberry to Android and then iPhone. Is this a factor? Market share in the smartphone realm has also been affected recently. Per Nielson’s current analysis, Apple still takes the lead in market share with 28.6% trailed by RIM at 26.1% and Android in third with a 25.8% share. ReadWriteWeb adds, “The stats are remarkably different in terms of recent acquirers.” (Recent is defined by Nielsen as mobile phone users who have acquired phones in the last 6 months.) From this perspective, Android is the leader with 40.8% choosing this OS instead of Blackberry at 19.2% and Apple 26.9%. The appeal of Android devices for many consumers may be based on the lower price point. Do you find price point to be a key influencer in your decision to choose an operating system? Or, is it just the “cool” factor in having the latest, greatest apps on your smartphone? Lenco Mobile offers platforms for many different types of mobile phones. Notice how iPhone clinches the top spot and three spots overall. Samsung is 2nd and has two spots in the list. Blackberry is 4th securing 3 spots overall. Motorola and LG appear only once in this list however the Motorola Droid’s popularity especially on Verizon secures the 3rd spot. iPhone has come down in cost which may have influenced its position in the top spot. One exciting development in the news of late, is that at an enterprise level, companies are allowing their workforce to choose the handset of their choice. We may see a spike in certain handsets. The marketing push carriers are making for each of these devices also will have an effect on who wins the race. While a large increase in mobile commerce activity can be attributed to an economy back from a horrendous 2009, much of the gains should also be credited to retailers and consumers coming into their own via mobile offerings and mobile adoption (respectively). Brands have finally woken up to the reality that consumers want and will use their mobile devices to research, locate and purchase products, and this represents a burgeoning opportunity to not only increase sales but also meet increasing brand expectations. IDC estimates that mobile savvy shoppers will account for $127B of the $447B (or 28%) spent this past holiday season with retailers. And while these are not directly mobile purchases, they include purchase influenced by mobile devices and show how far this medium has come in the past year toward being a critical piece to any retail marketing campaign. Consumers are looking for easy to access product information as well as consumer generated content which indicates the additional importance of social media in the process, albeit a smaller one (direct friends and trusted sites account for more influence). One interesting finding relates to age demographics, whereas the adults (both 25-44 and 45-54) comprise both the highly and moderately connected consumers who utilize their devices for purchase decisions (Mobile Marketer). This is a significant section of the consumer population and one which much more purchasing power than the normally tech savvy leading Tweens or Millennials. Regarding mobile transactions specifically, EBay Inc.’s PayPal saw a 300 percent increase in mobile payments from the official start of the shopping season on Nov. 15 through Dec. 15 compared to the year-ago period (as reported by Mobile Marketer Daily). PayPal states its belief that the mobile phone will replace the wallet when it comes to retail transactions in the future. Increased smartphone ownership has driven this trend, which has taken off this past year. As consumers continue to demand a convenient and safe shopping experience, more merchants will follow in accepting mobile payments. A seamless checkout process is critical as consumers don’t want to be slowed down by resizing screens or entering credit card information. Ebay was another retailer that had significant success this past holiday season reporting a 134% increase in mobile sales growth from the previous year (Nov. 25th – Dec. 25th). The top items were clothing, shoes, accessories and mobile phones (Mobile Marketer Daily). Interestingly some of the most expensive items purchased via mobile were Rolex watches, diamond jewelry and designer handbags, which show consumers are increasingly comfortable purchasing larger value goods on their phones. Experts in the field, including Lenco Mobile, expect these trends to continue in 2011. One thing is for certain, mobile applications aren’t going away anytime soon as developers continue to create apps for both business and personal use. The IDC estimates that the global market for mobile apps will be over $35B by 2014. However, Harris Interactive research found that nearly 4 in 10 mobile app users are disappointed in the applications from their favorite brands, with the prevailing sentiment (73%) being that an app should be easier to use than their website. And with the rise of smartphones, improved 4G connectivity and the creation of HTML5, the mobile browsing experience has been greatly improved. This will certainly have an effect on the usage of apps in the coming years, especially since finding, downloading and configuring these applications takes time and effort. And consider this, most mobile users only engage with between three and five applications on their phone on a regular basis. The majority of these apps are for either social networks or games and less than 10% of mobile owners still use an application one week after they download it. Some analysts have gone so far as to compare the popularity of mobile applications to that of the ringtone or website widgets. That analysis may be a bit extreme especially as ingenious ways of integrating a phone’s camera functionality into specific applications and the convenience of mobile commerce apps that leverage Near Field Communication (NFC) technology. Lenco Mobile to Brands – build apps only if it makes a lot of sense! Lenco Mobile has a team of world-class developers that can build and manage custom applications for your brand, however it recommends that any application development be done after careful consideration and research among target consumers. Let’s face it, application development is expensive and that cost needs to be weighed against smartphone usage (within the demographic) and mobi site experiences with HTML5 as well as the ability to tie in SMS and MMS message campaigns. There is also platform segmentation to consider. Many brands were quick to develop mobile applications that were neither sharp nor particularly useful. This can only damage brand equity. In taking a different approach to applications, Lenco Mobile has developed targeted applications within its UniversalPlayer™. Its player is one of the leading internet broadcasting platforms, reaching over 40 million unique listeners each month. Within this interactive platform, listeners can utilize apps for news, sports, gossip, jobs and more while they are enjoying their favorite broadcast. In this context, apps are a value-add to an existing channel where consumers are already engaged. Developers are invited to submit their applications for review as the app store will continue to grow. What’s Driving the Success of Lenco Mobile Broadband? The internet penetration around the globe irrespective of geographical positioning or cultural and economic diversity has been phenomenal. It would not be exaggerating to say that the advent of internet has in a way connected the diverse population around the world like never before and given a global edge to the way business is done today. The introduction of mobile broadband in recent times signifies the commencement of a more user-friendly medium of communication. Recent surveys have revealed path breaking possibilities for both mobile business and mobile broadband alike. While the number of mobile subscribers around the globe is on a meteoric rise – estimated to touch the 5.2 billion mark by the year 2011; there has also been an astounding growth in the average monthly spending on mobile broadband. A recent survey by Nokia Siemens Network has recorded a 40% increase in the average spending on mobile broadband per month in the current year, 2010, in comparison to 2009.
Credit goes, to a certain extent, to the increase of disposable income amongst the young generation and also the easy accessibility of mobile broadband connection compared to the fixed broadband. Another emerging trend for mobile broadband is an increasing interest in high-speed mobile broadband. This has also contributed to the paradigm shift from fixed line broadband to mobile broadband in recent times. Lenco Mobile – a pioneer in mobile technology – has been offering mobile broadband services at affordable rates. It not only helps you stay connected to your consumers and patrons even when you are traveling, but will also help you achieve the requisite competitive edge in business like never before. Apart from that, Lenco Mobile’s professional expertise in mobile advertising is also an asset for those availing its services. With this, you can promote your business to every corner of the globe with creatively and strategically designed text based or video based advertisements. Interestingly, this innovative method of mass advertising has proved to be one of the most cost-effective business propositions; as it assures the maximum impact with a minimum investment. Lenco Mobile broadband also promises to offer you premium services to reach out to a wide range of your customer base in the quickest possible time. Its mobile advertising campaigns are designed with care so as to generate the maximum leads and eventually propel conversion and sales. Its broadband services are the epitome of superb coverage, enhanced quality and faster data speeds. Come, explore the infinite possibilities with Lenco Mobile broadband services and conquer the world of opportunities like never before. The internet and then mobile phones have literally shrunk the world like never before. Nonetheless, it has brought fortunes for the global players in the market, who can now access consumers anywhere and anytime – to make themselves heard. The recent trends have shown an upward trend in mobile marketing on the regular mobile phone and smartphone alike. The United States alone has registered the prospect of hitting the $797.6 million mark this year in mobile advertising and successively to $5.04 billion by 2015. This growth trend is nothing but phenomenal in business terms and has attracted major players like Google, Apple and Lenco Mobile to create a competitive space for themselves in this highly burgeoning market. Hence, if you like your business to flourish like never before, there cannot be a better time than now when mobile advertising is being considered a sunshine industry by trade experts. However, it is not as simple as it sounds. A carefully customized mobile advertising strategy has to be designed and developed after a comprehensive research and analysis of your target market. But how do you choose your mobile services provider? There are a host of mobile platforms vying for that lucrative share of the industry pie. But if you are looking out for a reputed player in the field of mobile commerce with an accomplished track record of creating some of the most successful mobile marketing campaigns in the recent times, Lenco Mobile is the name you can put your money on. Lenco mobile advertising has geared up to play an even larger and responsible role for your business. With new technology and an expert team of skilled professionals, Lenco Mobile makes sure that your business attains the required exposure and mileage courtesy the mobile marketing campaigns it has designed for it. The ultimate goal of mobile marketing is to reach out to the maximum audience in your database with a single stroke of strategically scripted and visually appealing mobile video ads via MMS messaging. While mobile messages are slated to have the maximum readership of 95 percent; video based advertisements packed with interesting concepts has now been acknowledged as the surest way to catch the maximum eyeballs. This leaves behind conventional options like billboard and prints media advertisements, thus making space for maximum impact with minimum investment. If you too want to boost your business revenues with the mobile advertising, unleash the Lenco Mobile advantage.